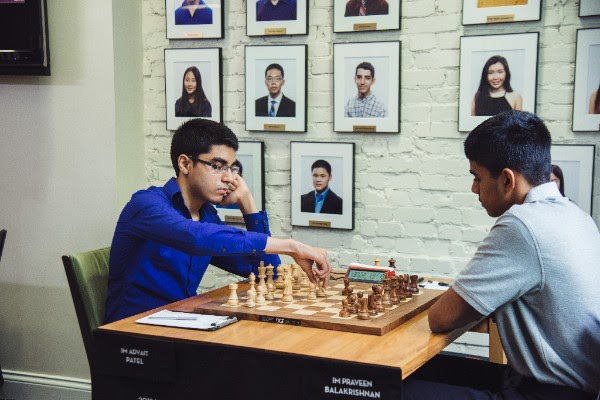 In the Junior section, defending champion Awonder Liang won a key game to gain ground on Advait Patel. Contrastingly, in the Girls’ section, Carissa Yip extended her lead to a full point. The game of the day was Mika Brattain vs. Awonder Liang. Both players came to the board ready to play fighting chess for the win. 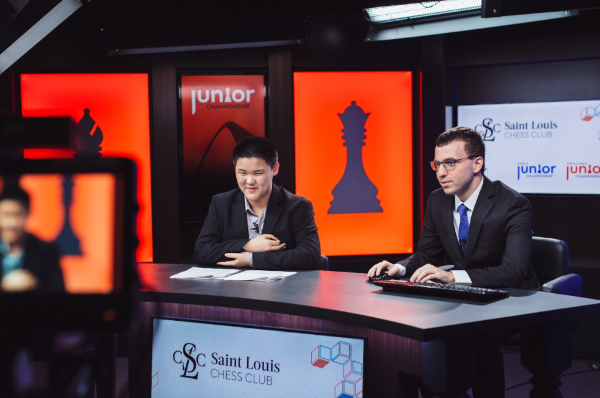 Liang played the very dynamic Grunfeld Defense, and Brattain followed suit when he sacrificed a knight to open up Liang’s kingside. Brattain was able to create enough pressure that Liang dashed his king into center to evade the attack. However, after a trade of rooks and then queens, Brattain’s king attack petered out, and Liang won the ending with his extra piece. This victory allowed Liang to gain half a point on the tournament leader, Advait Patel, who drew his game. Initially, Patel had good attacking chances against Praveen Balakrishnan when Balakrishnan delayed castling in the Taimanov Sicilian. After a few slow moves by Patel, Balakrishnan was able to equalize by finishing development and castling. The players soon traded down to a rook ending and agreed to a draw. Over the last 5 rounds, Balakrishnan has proven himself to be a formidable competitor. Against four grandmasters and the tournament leader, he’s emerged with an undefeated +1 score and a 2650+ US Chess performance rating. 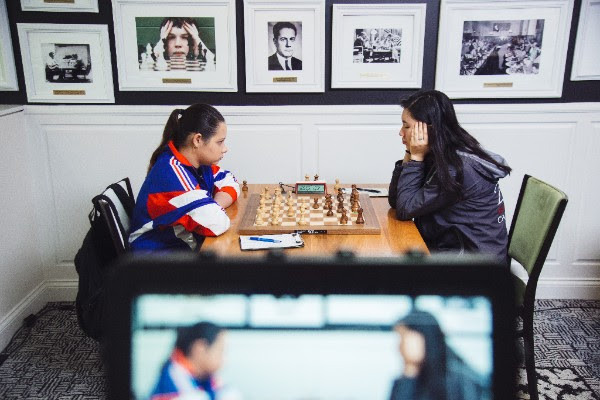 In Annie Wang vs. Alex Bian, Bian obtained the bishop pair while Wang achieved a potent knight on the d5 outpost. Bian sacrificed a pawn to take command of the dark squares, soon winning the exchange. He then carefully converted the rook vs. bishop ending into a victory. The grandmaster duel of John Burke vs. Akshat Chandra was a 30 move draw in the Scotch game. These two players are tied for third, trailing Patel by a full point along with Balakrishnan. Though there are still four rounds left, with each game that passes, their chances to catch up dwindle. Andrew Tang vs. Ruifeng Li was an 86 move struggle for the upperhand. Though Li gained an extra pawn, it wasn’t quite enough for the win in the notoriously drawish rook and opposite color bishop ending that arose. Heading into the rest day, Patel leads with 4 out of 5, and Liang is close on his tail with 3.5 points. Carissa Yip essayed the King’s Indian Defense against Nastassja Matus, showing aggressive intentions from the start. 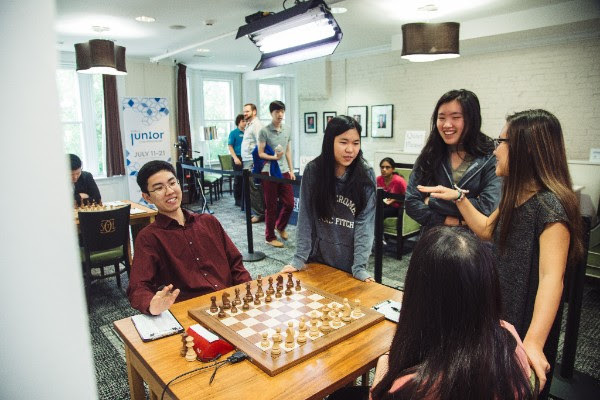 After a double-edged middlegame, the players traded queens, and Yip’s bishop pair came to life. Under pressure, Matus made a tactical error, allowing Yip to win material and conduct a mating attack. This victory guaranteed that Yip maintain her lead at the halfway mark. 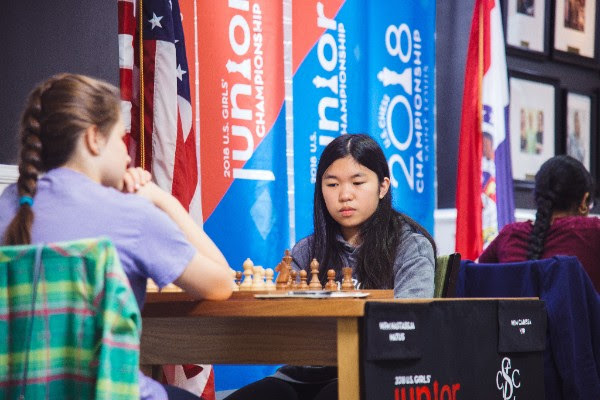 With 4.5 out of 5, Yip has achieved a US Chess performance rating of 2600+, far beyond her rating entering the championship. 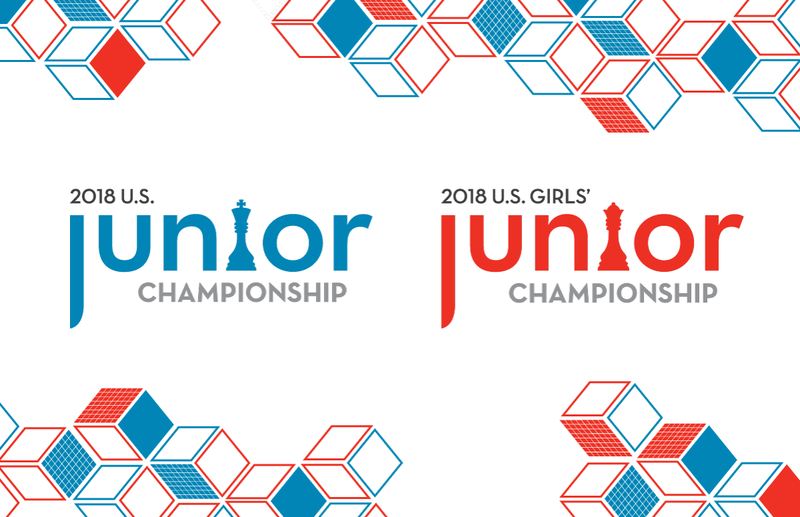 The most dramatic game of the round was Thalia Cervantes vs. Jennifer Yu. In an incredibly hard-fought battle, the advantage switched hands several times. First, Yu won a pawn. Cervantes gained a king attack by penetrating into Yu’s position with her queen and rook. Yu gradually defended and utilized her extra pawn, even winning a second one. As the players reached mutual time trouble, the game was likely to end in a perpetual check when Yu made a heartbreaking blunder, allowing a checkmate in three moves. Yu’s loss increases Yips lead over the field to a full point with only Maggie Feng trailing with 3.5. In Sanjana Vittal vs. Maggie Feng, the players traded queens fairly early in the French Winawer. Yet, another octopus knight was achieved, this time by Vittal, who was pressing a slight advantage in the ending. 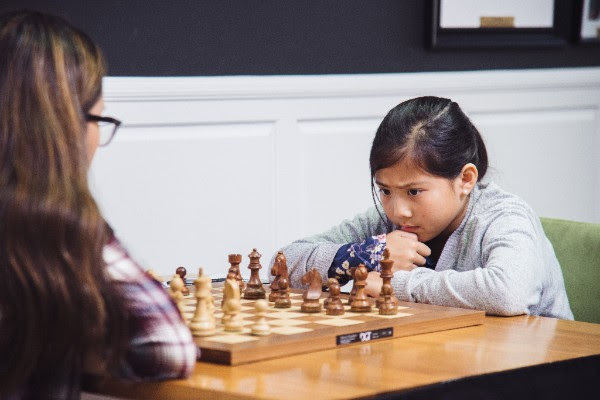 However, Feng managed to breakthrough on the kingside with her king and rooks, gaining strong connected passers on the e- and f-files that eventually decided the game. Martha Samadashvili won her second game in a row. After many moves of a balanced struggle in the Sicilian, Samadashvili gained one pawn then a second against Sophie Morris-Suzuki. Samadashvili finished the game with a fork tactic to end up ahead a full knight. Emily Nguyen vs. Rochelle Wu was a close game throughout. Nguyen gained an extra pawn, but the resulting rook and opposite color bishop ending didn’t offer too many winning chances, and it didn’t take long for the players to agree to a draw. Tomorrow is the rest day and the Saint Louis Chess Club’s 10 year anniversary celebration! The championship continues on Thursday. Will Patel and Yip coast to victory or will their rivals make them sweat?